Pack of 2 - Super Swivel Heavy-Duty Hose Reel Swivel - 1/2" NPT (SW9-08-08). Recognized as the industry standard hose reel swivel for the toughest applications, this Super Swivel Heavy-Duty Hose Reel Swivel with 1/2" NPT threads (SW9-08-08) is your best choice for replacing or upgrading leaking swivels found on most common hose reels. Made with durable nickel plated carbon steel material, this Super Swivel can resist many common agricultural chemicals for long life. The heavy-duty design of the Super Swivels not only make them ideal for agricultural applications, but also industrial and commercial applications. 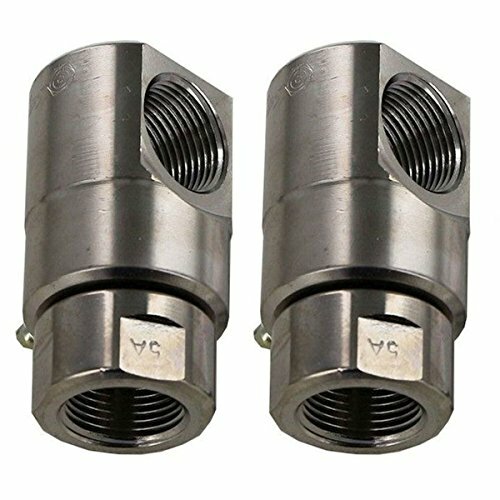 They feature a full flow design with minimal pressure loss and are rated for pressures up to 5000 psi to suit many of your spraying requirements. Lower hydraulic line congestion, hose kinks, hose twists, and shock damage result from the Super Swivel's live action swivelling, which help you reduce downtime and maintenance costs. Super Swivels can be adapted to most common hose reel brands, including Hannay and Reelcraft. NOTE: The 1/2" NPT thread sizes will actually measure around 3/4" if using a tape measure. If you have any questions about this product by Super Swivel, contact us by completing and submitting the form below. If you are looking for a specif part number, please include it with your message.